Two roads diverged in a wood and I—I took the one less travelled by, And that has made all the difference. Welcome to the world of JAMPians, where education means all round development of the children entrusted to us.. This is a school that has a mission to make each child achieve his and her best and for that we take up plethora of activities throughout the year to tap the potential of each child who enters the portals of Jodhamal. We at Jodhamal Public School strive to respect the unique individuality of each child, give the child the right kind of help for the holistic development. We believe that a child will be successful in life if we accept him/her as they are and inspire them to become what they want to become. They want to be liked, appreciated and to be respected their individuality. A child should always be accepted the way he/ she is rather than trying make clones. Copy paste doesn’t work well in today’s competitive age. We give lot of importance to make discipline a core value, encourage students to develop a sense of responsibility through a well planned academic schedule, House system, various Inter School, Intra School competitions and Sports activities. We expect them to do the same at home too like making the beds, keeping the rooms tidy, helping and supporting the family members in the daily chores etc. The school has a well-planned curriculum so that co-curricular activities also are given due importance. The school Almanac and Personal Booklet give all the important information on school like the routine, rules and regulation, uniforms, test schedules, holidays, co-curricular activities and feedback from teachers. The parents should ensure that their ward is actively involved in all activities. Wishing all readers a wonderful time while scrolling through the pages of the Magazine Endeavour which will showcase our student’s and teacher’s work and achievements during the session. Greetings from Jodhamal Public school. We all accept the fact that all children are unique and every child is important to us. With recent incidents of children abused and the incident of Gurugram, Jodhamal Public School has formulated a set of guidelines which all the members of the school must follow to protect children from any kind of unprotective act within the school premises. Please find the circular given today to all students and adhere to it as important stakeholders as we take parents as partners in running the school with full safety and security of the children and to give global citizens to the world. Meetings,discussions and brain storming of the entire staff is done on a regular basis. Any gray area of the school is not left unplugged for fool proof security system. Support staff is being sensitized for ensuring the safety and security of students during school time and while in transit to school and back home. We are getting the security /safety audit of the support staff done of their premises and personnel from their respective local police station and follow the security related advice for the safety of School children. Installation of 30 additional CCTV Cameras at all vulnerable areas/points in the School premises and ensure they are functional at all times. The school is getting the police verification and psychometric evaluation done for all the staff employed. Such verification and evaluation for non-teaching staff such as bus drivers, conductors, peon and other support staff will be done very carefully and in a detailed manner. Supporting staff is employed only from authorized agencies and proper records are maintained. The school also has a parent-teacher-students committee (PRA) to address the safety needs of the students and to take regular feedback from parents in this regard. The access to school building by outsiders is controlled and visitors monitored. The school has a separate committee for redressal of public/staff /parents/ student’s grievances, Internal Complaints committee on sexual harassment and committees under POCSO (Protection of Children from Sexual Offence). 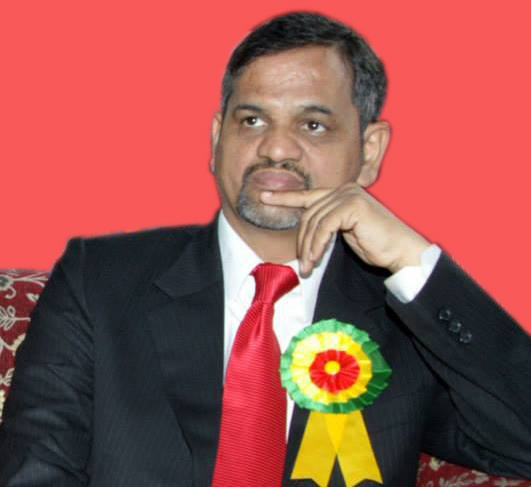 The school is strictly adhering to all the guidelines issued by MHRD and Board from time to time. You are requested to extend cooperation, sensitize the children to be very vigilant. Do not drop your child before 7:15 a.m. to school in the interest and the safety of the child. "Together we will win this war against a handful of anti-social elements." It is yet another year goneby and I am once again here to interact with you via this column. The Academic Year 2016-17 had been a year of achievements for Jodhamal Public School with all the blessings of Almighty and due to the good wishes of all our stakeholders. This year once again Jodhamal has been ranked No.1 school in J&K by the Elite magazine "Education World" in collaboration with Nationwide Survey Agency 'CFore'. Jodhamal is also recognized by 'Brain Feed' Magazine for the Academic Excellence and for the best infrastructure in J&K. We have also been awarded Six Star Gold Rating by UK based World Education Foundation. Our students have really proved their worth in all MUNs across the country. Quizzing has become a signature event for Jodhamal since where ever our kids have been going, they have come back with the winner's trophy. Where we are making such brilliant progress in diverse fields, we need to introspect our short comings too. Today's world is a global village. Everyone is connected to one another in this vast network generated by the internet. As said by Marshall McLuhan, a philosopher of communication theory, "The new electronic independence re-create the world in the image of a global village. "Dear Parents this electronic independence is inherently dependent upon the internet. It illuminates the lives of thousands of people by spreading knowledge internationally thereby making us global citizen. Humans are social animals, we always like to remain in some group or another and we prefer to follow what that group does.All ourculture and traditions are the product of this group-oriented facet of human nature. Hence it becomes all the more pertinent for us the parents and the teachers to monitor and see as to what groups are our children following on the internet or the social media. As of now the world largest social networking company, Facebook has more than 1.49 billion active users and the no. of users is increasing everyday. One of the most interesting thing to look at is the increasing number of students, users on such social networking sites. As per survey conducted by Pew Research Centre, 72% of high school and 76% of college students spend time on Facebook, Instagram, Twitter etc.These number indicates how much the student community is involved in the virtual world of social networking. The students of today get infected and influenced very easily by what others are posting on the social media resulting into frequent fluctuation in mind and self-control. Actions that attract more public attention hold more value for these students, even despite some of them being immoral or illegal. As a result of such posts sometimes the cyber bullying leads to depression among students. The most important things in a student's life is studying, learning good habits and gaining knowledge to become a person with high moral character. But today, as we see in various studies, this optional learning process is seriously jeopardized by students becoming entrapped by the plays of social networking. Students neglect their studies by spending time on social networking websites rather than studying or interacting with people in person. It can hamper their academic grades. Getting too involved in social media can lead to an addiction that inculcates bad habits. Students prefer to chat with friends for hours, and this leads to a waste of time that could have been used for studying, playing or learning new skills. Children are in a state of rat race to make as many virtual friends as possible and the so called 'Social Quotient' of a person is decided by how many friends do they have on Facebook rather than how good natured and congenial the person really is. Often, students who are not old enough to accurately analyze the world, just 'like' or 'comment' on social or political issues and at times they 'like' something really absurd on Facebook or Instagram bringing shame to the family they belong to and at times this leads to serious controversies. Considering all the above pros and cons, it is necessary to develop certain regulations over the use of such social networking sites, especially for students from 6th to 12th, since they do not have the proper understanding or what they are liking and how can it jeopardize their minds. We as teachers and parents need to be extra alert while providing the benefit of gadgets to our children. I am sure together we will be able to channelize our kids in the right direction in this digital age by being a little extra alert and not by denying the use of internet, since internet is a part and parcel of the 21st century learning. With this I wish all of the readers Happy Reading and would request you to give us your feedback via mail to encourage our little poets and writers. It is yet another year gone by and I am here to interact with you all via this column. The yester year had been a year full of blessings and achievements for Jodhamal Public School. This year God bestowed his choicest blessings on us and we emerged out the No. 1 Rank among schools of Jammu & Kashmir. We were also placed among the best 100 schools all over India by the Education World Magazine. We were put among the Best Schools of India by the Digital Magazine too for 2015-16. This year brought the highest honour to our school by being awarded 6 Star Gold Rating for Jodhamal Public School by the World Renowned Accreditation Agency World Education Foundation U K. This year also saw us having two teaching assistants from U K coming and teaching at Jodhamal. Laurene Bridgeman &Rebekkah Jerrum had a wonderful time at Jodhamal and a lot of cultural and educational exchange took place. Our students had done wonderfully well with the Quizzes this year and where ever they participated made their presence felt and came out with the Trophy from all over. Debating again was something which our kids did not let go and they did not leave any stone unturned in getting all trophies to the school. Super positivity was the mantra for our 2015-16 and in our endeavour we had created a World Record in our MPH where Mr. Vickrant Mahajan had signed maximum no. of books to create the Gunnies World Record. Our main focus at Jodhamal is to create a Global Citizen out of every child which walks through the portals of Jodhamal and hence we started Tony Blair's Faith Foundation the 'Face to Faith' at Jodhamal where our students interacted with students from all over the globe via Video Conferencing.Our school students did so well in the very first year that our school was awarded with the Gold Award by Tony Blair Foundation. We are giving the exposure of a different kind altogether to the students and parents at Jodhamal that we not only conduct the sessions for students but we do organize the parental sessions on a better parenting and also how to deal with your child without giving the child any stress and imposing any expectations. We also conduct the career Counseling Sessions for parents and Students both. According to me the Education in India still revolves around the marks or the Grades but now it is the high time when parents need to understand their children's interests and give wings to them in what makes them happy. We need to be unconventional with each passing day, today so many unconventional opportunities are awaiting our kids but we are stuck to the same Engineering or Medical or CA or IAS etc. I wish here at Jodhamal the parents do not see what and how much course is completed but they must see how much my child can comprehend and how much happy my child feels coming to the school. What extra is the school offering than the academics has become the yard stick to measure a school's strength today? I am sure with the help of the wonderful team of teachers here at Jodhamal, I can take the school to a different level with parental collaborations. I am ever so thankful to our trustees Mr. NandanKuthiala& Mrs. AratiKuthiala for their unflinching support at all times and for providing me a free hand to deal with the school, staff & students. I am also thankful to my Vice Principal & Administrative Officer for being my left and right hands in making Jodhamal the first choice of all parents seeking admissions for their kids. How can I undermine the contribution of my teaching staff and also the support staff in making our journey such a wonderful one as you all visualize today. We are super positive that if we work with full dedication and with a futuristic vision there is nothing which can stop us from growing strength by strength with each passing year. To our parents a word of advice please do not look at the marks or the grades of your child and never ever compare your child with anyone since God has gifted you with the most wonderful child who is unique in her/his own way. Just rejoice being parents and please give your names to respective coordinators as to how can you collaborate in our teaching learning process with your experiences so that we can invite you for some session on some day as per your convenience and get our students get the benefit of your being a part of Jodhamal Family. "Take up one idea. Make that one idea your life-think of it, dream of it, live on idea. Let the brain, muscles, nerves, every part of your body, be full of that idea, and just leave every other idea alone. This is the way to success"
"Old order Chang eth Yielding Place to New"
It is very well said that change is the only permanent thing in this world. Old goes to give way to new to spread its wings to reach the sky. 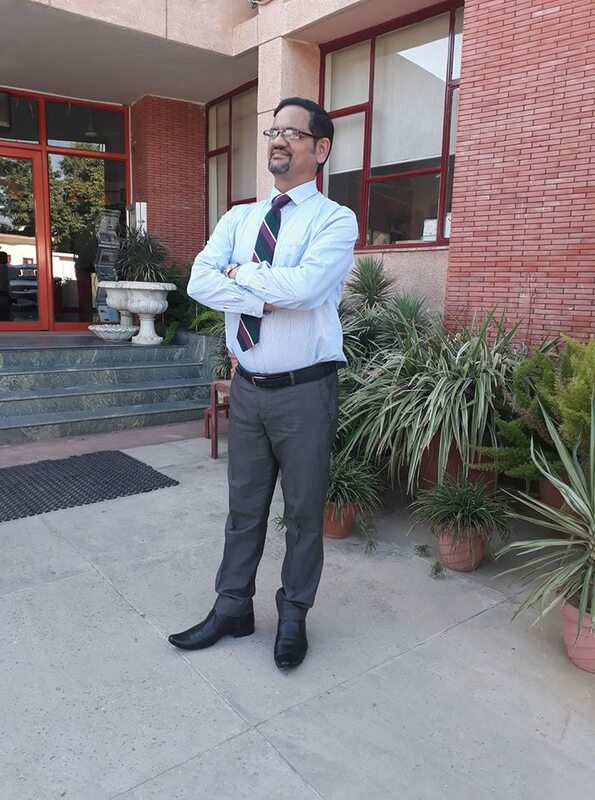 I am taking over the reins of Jodhamal Public School with a very optimistic attitude, as the infancy period of the school is over which is always a difficult time for any new institution, now it's time for the Take Off!! !Equipped with 23 years of experience in Education Field, I am all set to take JMPS to newer heights with the rich experience from Scholars Home Sr. Sec. 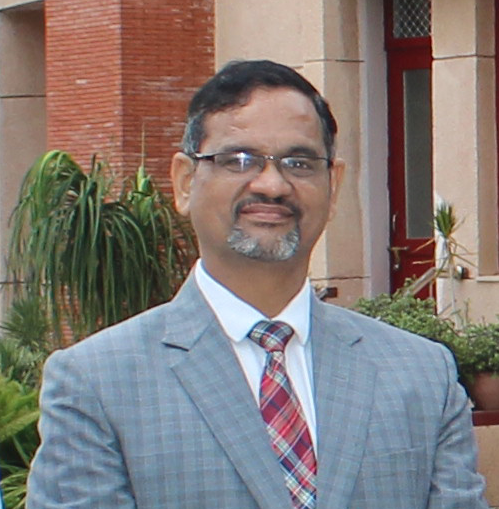 School, Dehradun as Coordinator, Doon International School, Palia as Principal and Unison World School, Dehradun as Dean of Activities. 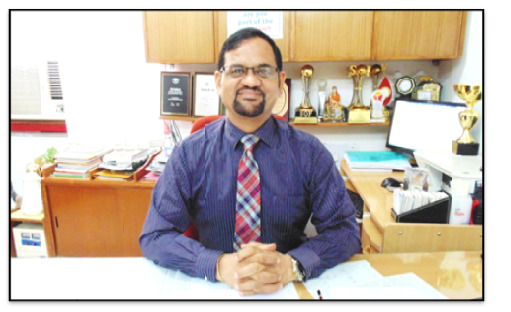 Doon International School, Palia as Principal and Unison World School, Dehradun as Dean of Activities. Today there is a one hundred eighty degree change in the education system, we need to be empathetic and compassionate yet provide an environment and curriculum where the child can explore and develop every facet of him/her to realize their true potential. Now the traditional parameters have become obsolete; now a techno savvy state-of-art school building,thoroughly trained and competent faculty, a plethora of activities for students to be engaged in are imperative. These are vital to provide an environment that's both therapeutic and beautiful. 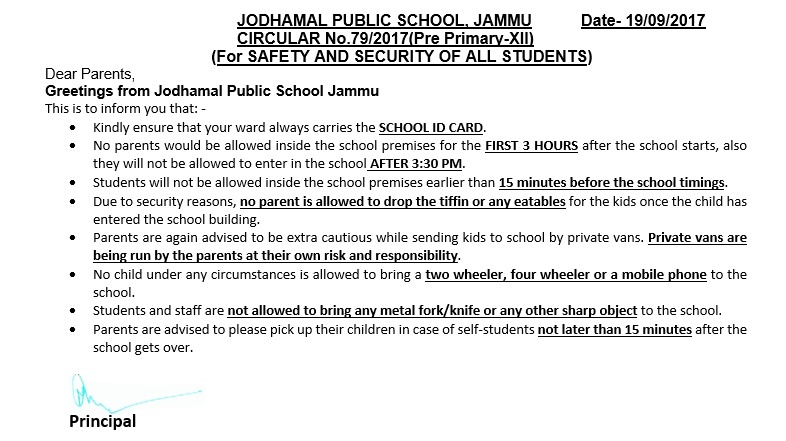 We at JMPS have a very dedicated and capable team of teachers to ensure the all round development of each child entering the thresholds of JMPS and the whole team is motivated & trained for excellence in various areas through in service trainings and workshops conducted at JMPS .It is an honour and privilege to be the Principal of JMPS, Jammu, the school that stands for excellence and continuously sets the highest standards. With the help of my wonderful team I am sure to fulfil these targets in unison and live upto the expectation of the Management and Parents/Guardians. JMPS is going to be the unique institution where we will hone the academic skills, fine tune the aesthetic senses and work towards building a holistic culture that values each student recognising their unique innate potential. Education is a creative partnership between Parents, teachers & students in an amicable atmosphere where each one is concerned of the well- being of the taught with joy and discipline.It is very true that it is very challenging task but yet a highly rewarding one as well. Teaching format has changed with the implementation of Continuous and Comprehensive Evaluation (CCE) to the advantage of the children. With this I hope that we shall be able toproduce extra-ordinarily active and efficient Global Citizens with clear perception to make their country feel proud of each one of them. I have an idealistic and passionate view of education. I want, what all parents and students would have wanted i.e. they should be inspired, motivated and appreciated in an environment which is stimulating and exciting, happy and safe….. I assure all the parents and guardians that they will find their children growing in the mostinvigorating environment and yet closely connected with the rich culture and values that form the backbone of every Indian's existence. However, all are always welcome to come to me with constructive suggestions or any issues for the betterment of JMPS, as I will always be available for my staff, students and all parents.